Because of customization and ease of use, a Silverado Shower is perfect for seniors with mobility concerns, says Leonard. 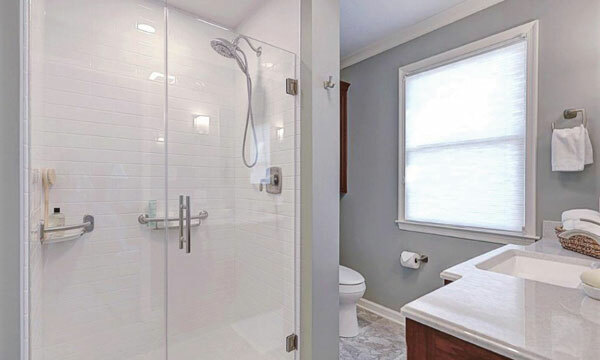 “We are the experts in tub-to-shower conversions with over 20 years of experience.” He notes that most conversations are being completed in two days. Every solid surface shower that Silverado installs is custom-designed to meet any mobility challenges and to fit the needs of the users. Features to choose from include walk-in showers, floor-level entrances, shower seats and benches, roll-in edges on the shower pan, customizable easy-reach shelves and caddies, handheld shower wands, and grab bars. “Safety and ease of use are the ultimate goals,” says Leonard. The design process starts with a solid one-piece shower. Then you can choose between low profile, standard height or ramped curbs in standard and customized sizes. There are also custom wall surrounds in smooth, textured, slate tile, or subway tile finishes with over 50 color options. Seamless, nonporous surfaces are ideal for use in the bathroom, says Leonard, since there are no microscopic gaps where mold, germs or bacteria can hide. For a fully custom look that transforms the entire bathroom, matching solid surface vanities with integrated, seamless sinks can be installed to complete the space. Escape from the everyday and rejuvenate your bathroom into your very own luxury sanctuary, as practical as it is beautiful. Silverado Showers serves the greater South Sound area, including South King County, all of Pierce County, Gig Harbor, Port Orchard, Lacey, Olympia and surrounding areas. For more ideas on how you can customize your solid surface shower, check out silveradoshowers.com or visit the showroom in Fife.